The SARS compliant solution is ideal for rapidly growing businesses who need a comprehensive payroll. 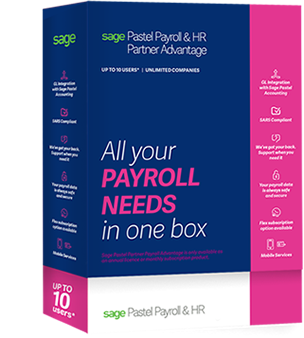 Sage Pastel Partner Payroll Advantage software will offer you all the advantages you have come to expect from this trusted brand. The SARS compliant solution is ideal for rapidly growing businesses who need a comprehensive payroll. As with the other Sage Pastel Partner solutions, your tax submissions and EMP201/EMP501 returns are simple, your payslips are customisable and there is smooth General Ledger (GL) integration with Sage Pastel Accounting. Mobile services that allows employees to make use of the mobile app to access payslips and leave balances. You can now also enjoy more flexible processing methods for managing larger sets of data. The cloud based Self Service portal allows for online data storage, workflow and approval, and data sync between cloud and desktop. HR Software System, suitable for any size and type of business, performance reviews and disciplinary procedures have never been more accurately recorded. Because the system is so concise and reports are customised to each employee, avoiding CCMA cases and compensation for wrongful dismissal is guaranteed. Single user or unlimited user options. What’s even better is that the HR Management Software System integrates easily with the Sage Pastel Partner Payroll software program, making for a speedy return on your investment. Leave Requests: You can apply for leave via your smartphone by simply entering the start and end date of when you require leave as well as the type of leave, such as sick leave, annual leave or unpaid leave, to name a few. Self Service automatically retrieves the balance of annual leave days due. The leave application form will be sent to your direct manager who can either accept or decline the application. A full audit trail is available. Travel Claims: Keeping track of business travel has never been this quick and easy! You can simply submit your travel claims via your smartphone! Depending on the workflow setup, this can, like with leave applications, be accepted or declined by your manager and then forwarded to the Payroll Administrator. Simple. Update Details: You can update your personal details, contact details, physical and postal address as well as banking details via your smartphone. Once the changes are approved by your manager, the Payroll Administrator is able to automatically update the Sage Pastel Payroll & HR system at the click of a button! View Payslips: Self Service is a secure application using similar security as online banking vendors ensuring your payslips are kept strictly confidential. Exclusive to our Flex subscription offering: You can securely view current and historic payslips on your smartphone. Simple and convenient! View Leave Balances: You can view your leave balances, such as sick leave or annual leave, on your smartphone. Self Service automatically retrieves the balance of leave days due as well as leave days taken and accrued. This makes applying for leave even easier than before. Pastel Payroll Self Service, employees can apply for leave, submit travel claims and update their personal details online or via their smartphone, anywhere, anytime. Self Service app, payroll administrators and business owners will get their payroll software updated automatically, eliminating manually recapturing of leave or travel claim forms. The Multiple Transaction Manager Module allows you to give the entire company a salary increase based on either a set value or a specific percentage and process a production bonus or commission by only using one screen. Over shutdown periods, putting your entire workforce on leave has never been this quick and easy. This feature allows you to make global updates to any transaction within the Payroll system to all, or a selection of employees. These transactions can include leave, bonuses, travel allowances and commission. Sage Pastel Partner Payroll’s Salary Structuring Module offers you amazing functionality to calculate individual employees’ remuneration packages. It is like having a Salary Structuring Assistant! This module simplifies the complicated task of structuring a Total Cost To Company remuneration package, according to the employee’s letter of appointment. By simply entering the total package value and various package components, Sage Pastel Payroll & HR will calculate the value of the remaining Cash Component and update the employee’s payslip with the structure you define. Alternatively, make use of the Nett to Gross Package calculation to accurately determine the Gross Basic Salary required to ensure the employee receives an agreed Nett Pay amount in each pay packet. The Salary Structuring Module offers eight calculators to assist you with the quick calculations of various allowance and fringe benefit values. Based on information provided by your employees, you can now calculate an accurate value for Travel Allowances or the taxable benefit value of a Company Vehicle without having to understand or refer back to any of the complicated rules and regulations required by legislation. Our Salary Structuring Module can be used to structure an employee’s pay package using one of two methods namely Total Cost To Company or Nett to Gross Salary. In addition, there are eight calculators built into the Salary Structuring Module to assist you to calculate the fringe benefit of the Use of Company Vehicle, Private use of Assets, Free and Cheap Accommodation and many more. The standard functionality of the Salary Structuring Module has been enhanced with an Assistant Wizard which is available to set up new employee salary information.